In the June 1967 War, Israel militarily occupied the Palestinian city of Hebron in the southern West Bank along with the rest of the occupied territories. The following year, a group of Jewish fundamentalists rented rooms in a hotel on a busy street in downtown Hebron and refused to leave until Israeli authorities agreed to establish the settlement of Kiryat Arba on a hill just to the northeast of the city. In the years to come, several other settlements were founded in and around Hebron, including four in the center of downtown. They were and remain populated by some of the most extreme, violent and heavily-armed settlers in the occupied territories, many of whom were born in the United States. 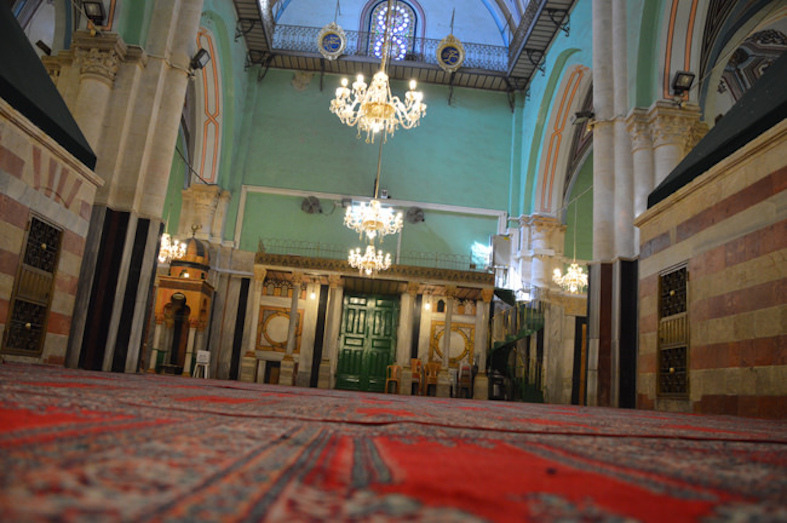 Many settlers were drawn to Hebron because of the earlier Jewish presence in the city and its religious significance, including the Ibrahimi Mosque, also known as the Cave of the Patriarchs, which tradition holds sits on the burial site of biblical patriarchs such as Abraham, revered by Muslims, Christians, and Jews. Many of Hebron’s settlers viewed themselves as “returning” to Hebron, which was home to a significant Jewish community prior to 1929. When rising tensions over Zionist immigration from Europe exploded into violence in 1929, 67 Jews were killed in the city. After the start of the occupation in 1967, the Ibrahimi Mosque and other parts of the city quickly became flashpoints as settlers protected by Israeli soldiers implanted themselves as heavily armed enclaves in the heart of the city. In September 1993, the Israeli government and the Palestine Liberation Organization (PLO) signed the first of a series of agreements that became known as the Oslo Accords. Oslo represented a major shift in Israeli policy, which had previously rejected any dealings with the PLO, long considered the sole legitimate representative of the Palestinian people by the international community. Although the Palestinians had been made to renounce violence and effective claim to 78% of historic Palestine, and Prime Minister Yitzhak Rabin never agreed to the creation of a Palestinian state and continued building settlements despite promising the US that he would implement a freeze, Oslo infuriated Israel’s right wing, including Goldstein. Politicians, including future prime ministers Benjamin Netanyahu and Ariel Sharon, stoked the flames of incitement against both Palestinians and Israelis like Rabin, who advocated talking to the PLO. The poisonous atmosphere created would eventually lead to the assassination of Rabin in 1995 by a Jewish extremist, Yigal Amir, who admired Goldstein and attended his funeral. In October 1993, after a series of previous disruptions, Goldstein poured acid on prayer rugs in the Ibrahimi Mosque, burning large holes in them, and assaulted six Palestinians worshipers. On October 18, Muslim authorities wrote to Israeli Prime Minister Yitzhak Rabin warning of the “dangers” posed by Goldstein, adding: “These daily violations in the Ibrahimi mosque cannot be given silent treatment.” Rabin’s office didn’t respond and Israeli authorities took no action. Early on the morning of February 25, 1994, Goldstein, wearing his army uniform and carrying his army-issued assault rifle, walked past Israeli soldiers manning a checkpoint and into the Ibrahimi Mosque. It was the holy month of Ramadan for Muslims and there were 400 or 500 Palestinian men worshipping. According to reports, once inside, Goldstein observed the scene and waited until those present turned towards Mecca and knelt to pray before opening fire. Twenty-nine Palestinians were killed and some 150 wounded before Goldstein’s victims subdued and beat him to death. According to a report in The New York Times, at least one Palestinian was shot and killed by Israeli soldiers stationed outside the mosque as panicked survivors attempted to flee to safety and others may have died as a result of being repeatedly stopped en route to hospital by soldiers wanting to search the vehicles they were being transported in. In the civil unrest that erupted across the occupied territories, Israeli soldiers killed more than 20 Palestinians and wounded hundreds of others. As is often the case with gun massacres in the US and elsewhere, many eyewitnesses reported seeing more than one gunman, however no conclusive evidence has come to light proving there was more than one killer. The massacre provoked international outrage and condemnation. The UN Security Council passed Resolution 904 without a vote, calling for “measures to be taken to guarantee the safety and protection of the Palestinian civilians throughout the occupied territory.” Resolution 904 resulted in the creation of the Temporary International Presence in Hebron (TIPH), which was supposed to protect the Palestinian population. However, Israel has only allowed TIPH to act as observers, leaving Palestinians in Hebron at the mercy of settlers and the soldiers assigned to protect them. A round-the-clock curfew was imposed on Palestinian residents. Israel forcibly divided the Ibrahimi Mosque to create a separate prayer space for Jews with a separate entrance. In addition, the mosque would be opened exclusively for Jews 10 days a year, and Muslims 10 days a year. Palestinian shopkeepers on Shuhada Street in the heart of Hebron were forced to close their businesses, which were welded shut by the Israeli army, under the pretext of securing settlers living on the busy commercial artery. Palestinians were restricted, at first from driving and later from walking as well, on a large section of Shuhada Street, prompting its nickname of “Apartheid Street.” The US government spent millions of dollars through USAID renovating Shuhada Street prior to its segregation, most of which is now reserved for the exclusive use of Jewish settlers. Numerous new Israeli military checkpoints and obstacles to movement were put in place making it difficult for Palestinians to move around the city, including children who must pass through checkpoints to get to school. There are over 120 obstacles to Palestinian movement designed to segregate “restricted areas” (settlements and surrounding areas) from the rest of the city, including 18 permanently manned military checkpoints. Several streets in the center of downtown Hebron that lead to the settlements are prohibited for Palestinian traffic and some also for pedestrian movement. 512 Palestinian businesses in the restricted areas have been closed by the Israeli military and at least 1100 others have closed due to restricted access for customers and suppliers. More than 1000 Palestinian homes located in the restricted areas, over 40% of the area’s residences, have been abandoned, according to a survey by B’Tselem and the Association for Civil Rights in Israel. Access restrictions imposed by the Israeli authorities in H2 [the 20% of Hebron under direct and total Israeli control], compounded by systematic harassment by Israeli settlers and, occasionally, by Israeli forces, have resulted in the displacement of thousands of Palestinians and the deterioration of the living conditions of those who stayed. Palestinians living in the restricted areas face serious challenges in accessing basic services, including schools, emergency health services and water and sanitation. The Israeli authorities justify the restrictions imposed on the Palestinian population as a means to protect the Israeli settlers residing in the city, as well as other Israeli visitors, and to allow settlers to lead a normal life. However, as with all other Israeli settlements, the settlements in the heart of Hebron City are illegal under international humanitarian law. There are serious gaps in the enforcement of the rule of law on Israeli settlers involved in violence and intimidation against Palestinians. Incidents include acts of vandalism, property damage, physical attacks, verbal abuse, and the harassment of children on their way to school. The large majority of complaints about settler attacks filed in recent years have been closed by the Israeli Police without indictment. The peace process that began with the signing of Oslo I in September 1993 was temporarily halted as Palestinian negotiators withdrew in protest. It quickly resumed and in 1997 the Protocol on redeployment in Hebron was signed between Israel and the PLO. It called for the division of Hebron into two areas: “H1” and “H2” and the withdrawal of Israeli soldiers from the former, comprising 80% of the city. H1 is nominally controlled by the Palestinian Authority but remains under overall Israeli control along with the rest of the West Bank, while H2, which encompasses the settlements, is under complete control of the Israeli army. Today, twenty years later, the extremist settlers of Hebron remain firmly entrenched with the full support of the Israeli government and military. A few weeks after the massacre the Islamic militant group Hamas responded by launching its first suicide bombing targeting Israeli civilians. Following the massacre, hundreds of Israelis attended a memorial for Goldstein at his gravesite. He was buried in Kiryat Arba, where a shrine to the mass killer was erected, quickly becoming a pilgrimage site for Jewish extremists. In 1999, the Israeli army demolished the shrine, however Goldstein’s grave remains a destination of pilgrimage for his admirers. The marker on his grave, which sits near the Meir Kahane Memorial Park, reads in part: “The revered Dr. Baruch Kapel Goldstein... Son of Israel. He gave his soul for the sake of the people of Israel, The Torah, and the Land. His hands are clean and his heart good... He was assassinated for the Sanctity of God."